Scores represent the percentage of current income the household is likely to replace, including projections for Social Security. Some households had scores above 100. Getting professional advice made a significant difference. 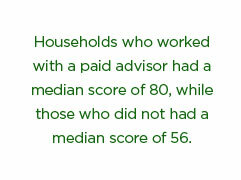 Households who worked with a paid advisor had a median score of 80, while those who did not had a median score of 56. Not surprisingly, having an advisor boosts investor confidence. Households with a paid advisor felt more financially ready for retirement and better aware of how much they need to save for retirement and to cover future health-care expenses, than households without an advisor. Advisors also contributed to confidence about choosing investments in defined-contribution plans. Advised households were more confident about their allocations to stocks, bonds, and cash, than households without an advisor. In fact, advised households tended to invest more in stocks and bonds than cash within retirement plans. Advised households had, on average, 39% allocated to cash, 40% to stocks, and 21% to bonds. 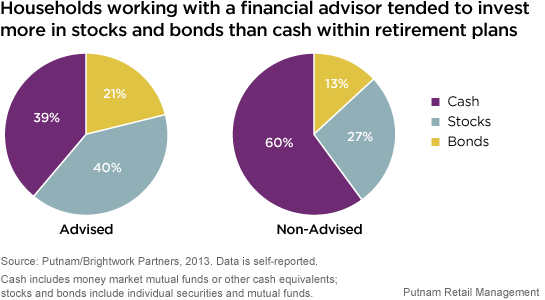 In contrast, households without an advisor allocated 60% to cash, 27% to stocks, and 13% to bonds. Advice can have benefits for investors. Professional advice can help both with the practical strategies for a successful retirement and with providing the confidence that helps investors commit to a long-term plan.